Owe back taxes and think the IRS doesn't realize it? If you continue to ignore the problem, you will eventually end up with the IRS placing a Federal Tax Lien on your property, typically including your home. A Federal Tax Lien means that the IRS has the right to seize your property if you fail to pay your back taxes. Continue to ignore your tax debt, and you will receive a notice that the IRS is demanding immediate payment, or your property will be seized. Once you receive this notice, you'll either pay within the specified time, or your property, including your house, can be seized and auctioned off to satisfy your debt. Having the Federal Tax Lien removed is the only way you can assure that your personal property will not be seized. The simplest way of removing tax liens is by paying in full. Thirty days after payment is received, the lien is removed. If cash is paid, the lien is immediately removed. Removing tax liens is possible if the IRS did not file in accordance with regulations, if removing tax liens speeds up collections, or if removing tax liens will be in the best interest of both parties. The debt was already paid in full. The IRS filed a Federal Tax Lien while the taxpayer was undergoing bankruptcy proceedings. The IRS did not follow procedures when filing the Federal Tax Lien. The statute of limitations for tax debt collection, which is generally ten years, has expired. The IRS did not give the taxpayer a chance to dispute the Federal Tax Lien. If you have a Federal Tax Lien on your property, or are in danger of receiving one, you need the experienced professionals at Top Tax Defenders on your side. 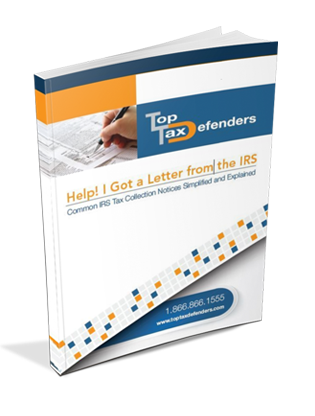 With over 27 years of experience resolving tax problems with the IRS, Top Tax Defenders can help you resolve your tax problems. Common IRS collection notices explained. "I can endorse without hesitation Top Tax Defenders...They really cared about me and fixing my situation, with or without their professional services! Top Tax Defenders is definitely a firm I trust and will use again if the occasion arises"